All this blogging stuff is incredibly new to me, hence the very basic nature of my blog set-up. I have recently purchased a racer as part of a cycle to work scheme, and with many cycling trips planned over the summer, I thought it would be really good for me to blog my journeys and experiences of cycling around the UK and abroad. Hopefully it will give an insight into the complex world that is cycling, through the eyes of a young(ish) amaetur. More posts, pictures and improvements to the layout should follow in the coming weeks. 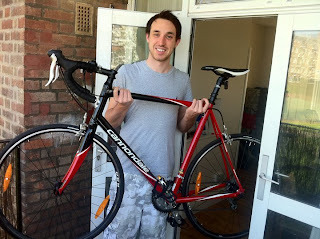 I plan to do a London to Oxford cycle ride on Sunday, which I will update you on as soon as I can.